With the Show / Hide Layer List button, the layers menu can be opened. In this menu, you can adjust the size of the points on the map. You can also adjust the color and transparency of the points. All layers that are added will appear in this window. The heatmap layer and the search results are also displayed in this window. 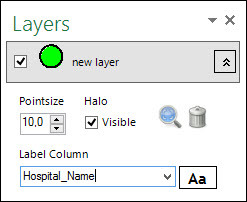 Labels can be activated by selecting a column to label. De Layers provide information on the map layers, the colour and symbol, the labels and thematic shading. Multiple layers can be open and active. Use the magnify glass to zoom to the whole layer. The trash is to remove the whole layer.